For the past few Tuesdays we have been traveling back in time, as is so often the case on The WED Page, reviewing vintage albums and books. Today we have decided to take our looks back to the next level. More than just a review of an old piece of media, we will be actually preparing and sampling a meal that was at one time, but is no longer, offered on Walt Disney World property. The recipe, the Papeete Bay Verandah’s Chicken Toa Nue, was taken from the Cooking Around the World with Mickey Cookbook. Chicken Toa Nue was served in coconut shells. 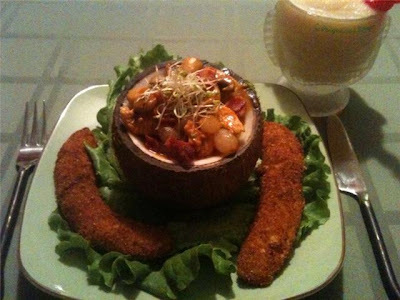 If you are going to follow the original meal’s presentation, prepare the coconut shells before staring the rest of the recipe. Then make the recipe in three parts: First, the Brown Sauce, then the chicken and, while the chicken is kept hot, prepare the fried bananas. Punch holes in the eyes of the coconuts and drain. With a very sharp saw, remove a small piece from the bottom of the shell so it will set flat. Cut off top of coconut about 3 inches down. If coconuts are not to be used the same day, place in a bag and refrigerate. Heat margarine and add flour, stirring to blend/cook and stir for 3 minutes. Dissolve bouillon cube in hot water. Gradually add to margarine/flour mixture. Cook and stir with a whisk until smooth and thickened. Add pepper and garlic to taste. Add tomato puree and brown gravy coloring. Simmer 5 minutes. Set aside. Cut bacon into ¼ inch strips and chicken into 1-inch strips. Cook bacon in skillet until golden. Remove and drain on paper towel. Pour off all but 2 tablespoons bacon fat. Add chicken strips and sauté for 5 minutes. Add mushrooms, bean sprouts, onions, Brown Sauce and Pernod. Simmer covered for 20 minutes. Taste and add salt, if needed. Stir in bacon. Keep hot while preparing bananas. Combine eggs, oil, water, cinnamon and sugar, mixing well. Cut peeled bananas in half lengthwise. Coat with flour, shaking off excess. Dip bananas in egg mixture, then coat with breadcrumbs. Fry in oil heated to 350 degrees for about 1 minute or until golden brown. Serve at once. I did my best to stick to the exact recipe, the only deviations being substitution of butter for the margarine and the use of fresh mushrooms and pearl onions instead of canned or frozen. As a “Child of the Polynesian” it was a wonderful trip back in time to prepare and enjoy this dish. The Brown Sauce was rich, with just enough salt to compliment the sweetness of the fried bananas. The rest of the favors were perfectly balanced between the onions, bacon and mushrooms. I would add that, at first glance, this recipe seemed a bit complex, with the three separate recipe sections, but I must say that they were broken down so well, that the overall creation of the dish was quite easy and a pleasure to prepare. Over all, I think this is a wonderfully delicious way to enjoy a bit of vintage Polynesian Village at home. Although I found myself longing for a bit of rice or perhaps bread to “sop up” all of the delicious sauce at the end. Whether you are a long time fan of Walt Disney World cuisine or new to the scene, I heartily urge you to try to get your hands on one of the many Disney Resort cookbooks and enjoy some of the delicious recipes for yourself. It is a terrific way to help make your time between visits to The World a little more Magical. That recipe looks fantastic--thanks for sharing!